It’s January: time for some lively, brightly colored food to perk up your plate! Although I use the recipes in The Gluten-Free Good Health Cookbook year round, this is the time of year when I really start looking through the pages for inspiration. 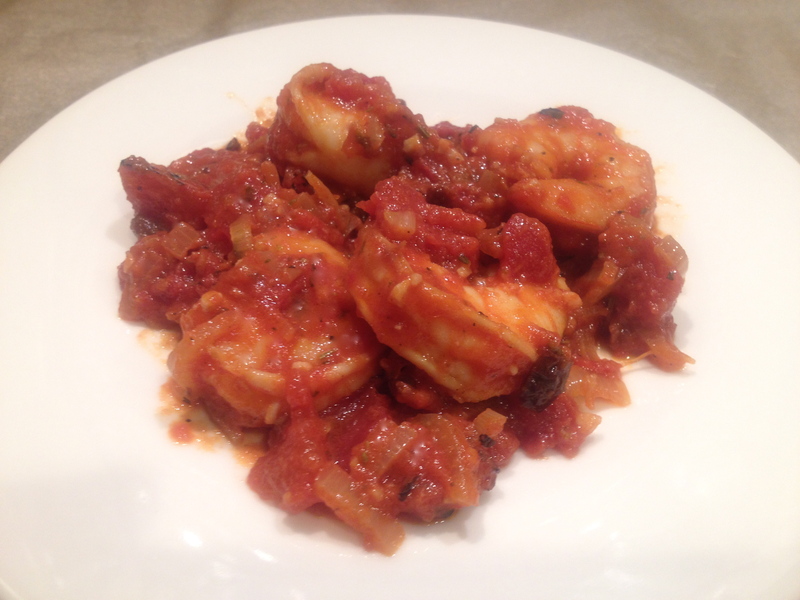 And I found just what I needed with this southwestern take on classic Shrimp Provençale. It’s a delectable dish that blends rich smoky tomatoes and sweet crunchy shrimp with a touch of chipotle pepper for a little heat. The preparation is simple because the recipe relies on a high quality convenience product: a can of fire roasted tomatoes (I highly recommend Muir Glen®). For weekday dinners, I like to serve it with a salad. But when I make it for friends, I’ll dress it up with some roasted vegetables and freshly baked corn muffins. Find a recipe for Corn Muffins in Gluten-Free Baking Classics or on Foodphilosopher.com. While you’re here, check out my updated Classes and Events schedule (above) and my three new Frequently Asked Questions sections under Gluten-Free Baking (above). Most of the questions and answers (except the ones for bread machines) are excerpts from my new upcoming book Gluten-Free Baking Classics – The Heirloom Collection, which you can read about in the My Books section. I originally expected the book to be out in mid to late November, but we ran into a few production problems. However, printed copies and eBook versions should be available in book stores and online within the next month. And for all you Yummly fans out there, I’ve added the “Yum” button to all the recipe pages on this blog. If you have a Yummly account, all you have to do is click on the Yum button and the recipe will automatically be save to your recipe box on Yummly. 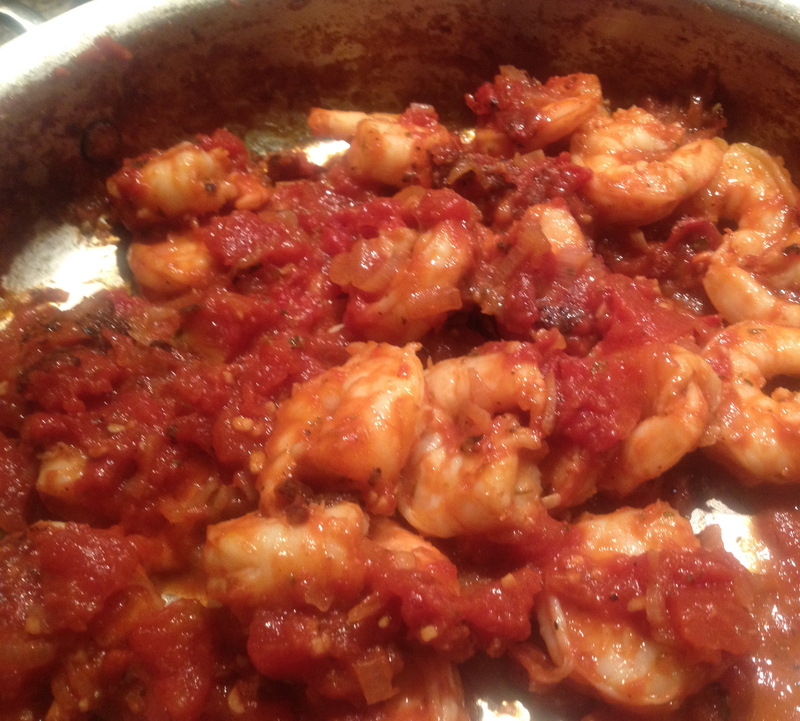 In the meantime, enjoy the shrimp and fire roasted tomatoes! Heat olive oil in a large, heavy skillet over medium-high heat. Add the shrimp and sauté until pink on both sides (the shrimp will finish cooking in Step 3 below). Remove shrimp from pan. Add shallots and garlic to the pan and sauté over low heat until soft, about 3-4 minutes. Turn off heat and add brandy. Turn on heat to medium-high; stir to deglaze pan and cook until almost evaporated. Add tomatoes, tomato paste, molasses (if using), chipotle pepper and oregano and bring to a boil. Simmer for 3-5 minutes. Add shrimp back to pan and cook until heated through, 1-2 minutes. Remove from heat. Season with salt and pepper, sprinkle with cilantro and serve immediately.